This week’s blog is dedicated to recognizing a particular nonprofit organization doing some spectacular things for seriously ill children around the country! Special Spectators is a nonprofit organization that uses Trumpia’s text messaging software to give more than 10,000 seriously ill children and their family members an experience of a lifetime at college sporting events around the country. The founder, Blake Rockwell, was inspired by his older brother, Chuckie, who was unable to play sports due to a congenital heart defect, but loved to referee and be involved as much as he could. Blake saw an opportunity to help when he realized these bedridden children were probably bigger sports fans than most healthy kids. It’s crazy to him that so few of them had ever been to a game. By partnering with collegiate and professional partners, Special Spectators is able to provide tickets to games and design fun days filled with special surprises and experience in areas of stadiums that most fans never access. These VIP Game Days are meant to provide the entire family with unforgettable experiences that many recognize as the best day of their child’s life. “The transformation of the children on game day is amazing. When they arrive, they are maybe a little shy, but over the course of the day, you see them smiling more and laughing, maybe for the first time since their diagnosis. And the reverse is true as well -- kids will see parents smile for the first time in months.” says Blake Rockwell. Special Spectators works tirelessly to create the ultimate red carpet experience for sick kids at sporting events. Game day begins with a behind-the-scenes tour, where these kids are able to explore their favorite stadium and meet coaches, players, and try on gear in the locker room. 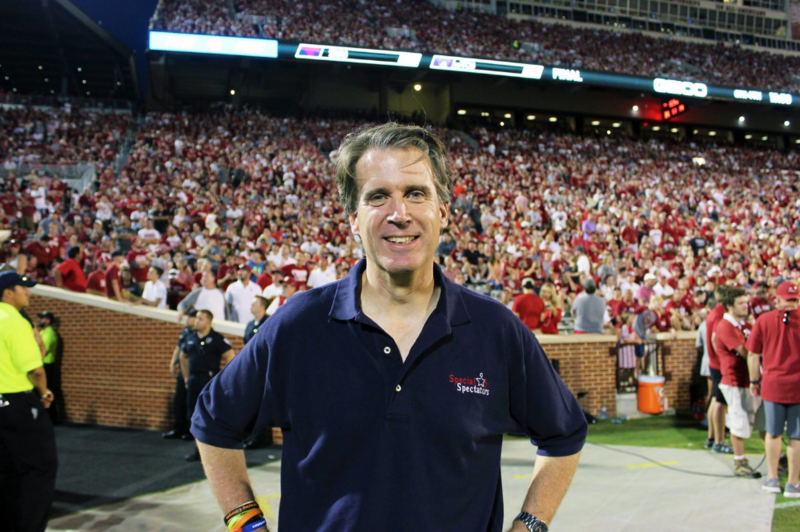 At the University of Oklahoma, children tried on diamond-encrusted championship rings in the head coach's office and sat at the anchor desk in the Sooners' broadcast center. Following that, families had a blast at a tailgate that is often attended by cheerleaders, the mascot, and even the marching band! At most of their game day experiences, Special Spectators coordinates an on-field acknowledgement of the kids during a timeout in the game. The children stand in the middle of the field, as thousands of fans welcome the Special Spectators to the game. At some of their games, there are more than 100,000 teary-eyed fans giving the kids the loudest standing ovation of the entire game. What really makes this experience special for these kids is they are connected with over 50,000 fans and receive heartwarming messages through texting. Special Spectators utilizes Trumpia’s SMS software to invite fans to text inspirational messages of encouragement to the children, which can make a lasting impact on the kids. Special Spectators uses Trumpia’s SMS software to advertise specific mobile keywords, such as “GoBears”, “GoOwls”, and “GoBucks”, for different sporting events on the scoreboard and jumbotron. Whenever a fan texts into the keyword, an automatic response is sent back to them, asking for fans to provide their heartwarming message to the Special Spectators at that game. After providing a heartwarming text message, fans are then provided a summary of the kids’ incredible day while also receiving additional information about the Special Spectators organization. Special Spectators takes the heartwarming text messages sent by fans and creates an electronic scrapbook, which includes pictures and a video of their game day experience. Not only will the kids be reminded of one of their greatest days, but this gives fans the opportunity to always be alongside these patients during their toughest days, and hopefully put a smile on their faces. Colleges around the country are lining up to be apart of the Special Spectators program. Special Spectators is funded primarily by private donations and corporate support. All tickets to sporting events have been donated by athletic departments and professional teams, which has collected a total value of $250,000 since 2002. Bob Stoops, a former Oklahoma University head coach, felt so strongly about Special Spectators, that he joined their Board of Directors. 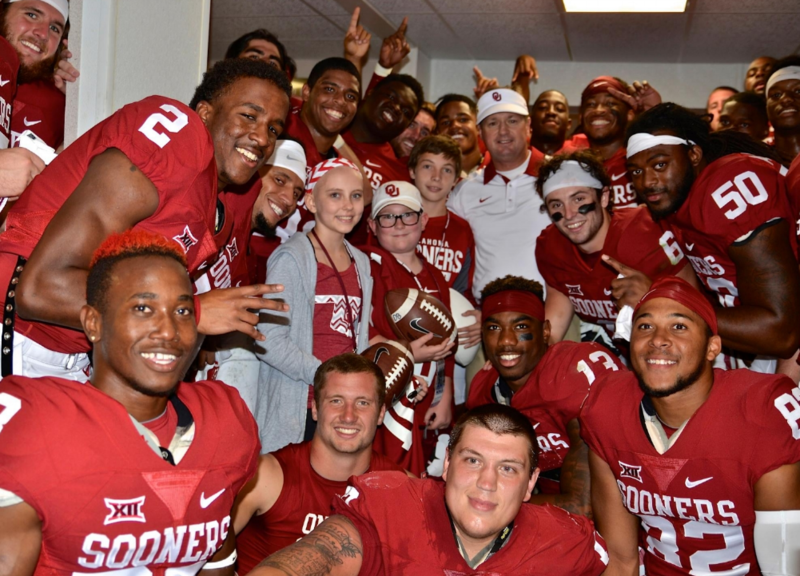 "This organization has been very special to me and to children in Oklahoma who are fighting incredible battles. These kids have inspired me and my teams in so many ways over the years, and I am thrilled to be able to serve them in this capacity," says Stoops. Oklahoma Women’s Gymnastics team jumped on board, and provided an all access experience, where kids met Head Coach K.J Kindler and watched the team directly from the floor. What makes this experience even more special is that this team went on to win the national championship. Virginia Tech Men’s Basketball Team created an amazing game day experience, which included a tour of the Hahn Hurst practice center, a meet and greet with head coach Buzz Williams, cheerleaders, and the mascot Hokiebird. Mizzou Athletics also teamed up with Special Spectators to give kids being treated at MU Women’s and Children’s Hospital a VIP experience for the Mizzou Football game vs. Auburn. Fans of Mizzou Athletics were able to send encouraging notes to the Special Spectators by texting "FightTiger" to 77453. These inspiring texts were then shared with the families after the game. Trumpia is so grateful to be able to work with such a wonderful nonprofit organization like Special Spectators. Being able to help Special Spectators create a life changing experience for sick kids around the country through our text messaging software is something we’re honored to be a part of. We’re blown away at how they use our system to attract hundreds of thousands of fans to provide donations and heartwarming messages to these special kids. Keep up the spectacular work Special Spectators! Are you a nonprofit like Special Spectators looking to use text messaging to broaden your audience and get more exposure for your cause? Click here to learn more!